If you've been in or near an airport recently, you're probably keenly aware of the security precautions the Department of Homeland Security takes to ensure U.S. air travelers and traffic are safe. ​Key to these efforts is the work of the Transportation Security Administration. According to DHS, the TSA screens nearly 2 million passengers per day in airports across the country. With so much responsibility and so much work, TSA security officer jobs offer abundant opportunities for criminal justice career seekers. The security officers of the TSA are the nation's first line of defense against threats to air traffic. Working in conjunction with other federal law enforcement partners, including Federal Air Marshals, TSA security officers help keep potentially dangerous people and items off of airplanes. 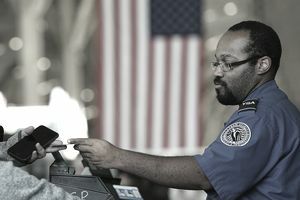 Specific duties for TSA security officers include screening passengers, cargo, and bags for prohibited and dangerous objects and materials; maintaining efficient passenger traffic flows through security checkpoints; and monitoring airport security measures and reporting potential vulnerabilities and weaknesses. According to the TSA, security officers may work in any of more than 450 locations around the United States. They work in airports at security checkpoints and airplane cargo screening areas. They interact with highly diverse groups of people and use technologies such as x-ray machines, body scanners, and hand-wand metal detectors. The Transportation Security Administration is looking for candidates who can learn and understand the concepts of aviation security processes and procedures, as well as the underlying theories behind them. Candidates must be able to think critically and independently to respond appropriately to a variety of security-related situations. Applicants must also be able to learn to use security instruments for screening, and they need to be able to work well with different kinds of people. Effective communication skills are also a must, and TSA officers need to be able to maintain a calm, polite and professional demeanor during potentially stressful encounters. TSA security officer candidates must be able to pass a background check, as well as criminal and credit history checks. Once hired, they must attend a two-week training program at one of several locations around the United States. The Bureau of Labor Statistics Occupational Outlook Handbook projects slower than average job growth for TSA screeners through 2022. Currently, though, there are more than 45,000 screeners employed in the industry. It means there remains a high potential for attrition and thus lots of employment opportunities. TSA security officers can expect to earn between $25,000 and $45,000 per year, depending on location, education, and training. They also receive excellent benefits, including health care access and defined contribution retirement plans. Is a Career as Transportation Security Administration Officer Right for You? Air travel is a vital means of transportation for millions of people across the country, and it's the job of the Transportation Security Administration to keep them safe. TSA security jobs offer a great opportunity to gain valuable experience to further your criminal justice and criminology career ambitions, and they also make excellent stand-alone career opportunities. If you enjoy interacting and working with diverse groups of people; have patience, understanding, and compassion; and are excited about the prospect of keeping the airways safe, then a job as a Transportation Security Administration Security Officer may just be the perfect criminology career for you.